Just because you have our DormCo Suprima Ultimate Height Bed Risers for your college Twin XL bed doesn’t mean that all your underbed college essentials need to be on display in your college dorm room. After all, dorm storage is meant to be tucked out of sight until you need it again. With our Extended Dorm Sized Bed Skirt Panel with Ties - White, you can give yourself an organized and clutter-free space while still keeping your college valuables hidden under your extra long twin bed. The extended height for a taller Twin XL dorm bed (45”W x 60”H) is perfect for your raised or lofted bed and gives you the organized and uncluttered look you need for a classic dorm décor style. 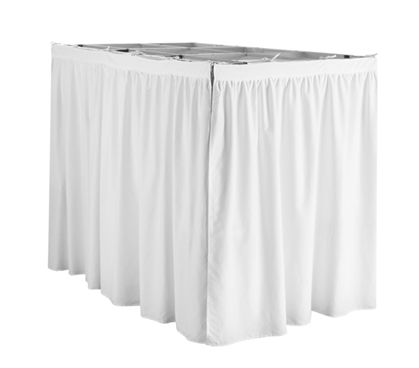 Made with 100% microfiber and easily machine washable, your essential dorm stuff and college storage is safe under your raised Twin XL dorm bed and protected behind our dorm sized bed skirt.